Simple & Sincere: Live in the Sunshine! I'm back, baby! I have been having so much fun playing with all of my new stampin' goodies. There's just something about new stamps, paper, inks and accessories that make me feel like all is right with the world, know what I mean? Today's card is one that we made at my last stamp-a-stack, which was all about products from the new catalog. 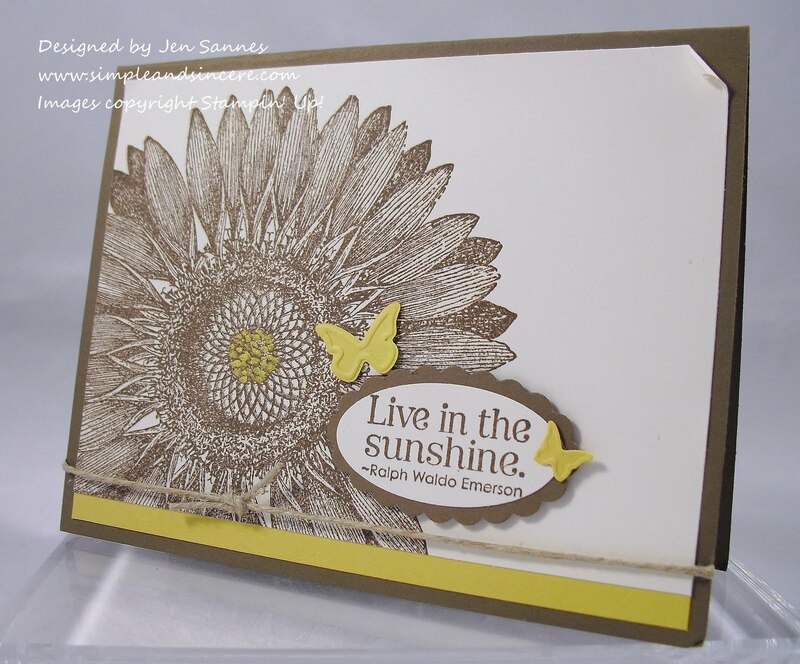 I saw this giant Sunflower background stamp, and I knew that I had to have it. I stamped it in Soft Suede ink on Very Vanilla cardstock and added those sweet Daffodil Delight butterflies. I also touched up the center of the sunflower with a few dabs of Gold Lame Smooch Accent Ink. It adds that touch of sparkle that makes the card so pretty. This was definitely one of the favorite cards from last Saturday's class. I'll be back soon with more to share. 'Bye for now! Wow I love this background stamp! Hope we get it in the UK!! That is a lovely card. Love the sunflower. Thanks for sharing.